Six year old Karishma and her mother created this cute Cow Picnic Chair to add more fun to your summertime picnic in the country. 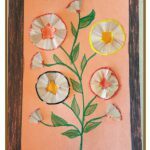 Karishma loves art and craft work. One of her favorite hobbies is to do artwork with her Mommy. She goes to River Ridge Elementary School in Evans, Georgia. Trivia: Did you know that cows are sacred in India? 9. Stick the cut out shapes using scotch tape. Using scotch tape helps to remove them easily later on.